Viswanathan Anand made what was perhaps the most impressive comeback in recent times with his epic win at the Candidates Tournament. With his win he earned the right to face Magnus Carlsen who dethroned him last December in Anand’s hometown. While sponsors have not been secured yet, the November rematch will prove to be a bit more interesting. As Anand was not given much chance in his match against Carlsen, he wasn’t given much chance in the Candidates. Most had predicted Levon Aronian and Vladimir Kramnik as winning the tournament and challenging Carlsen. Anand played superbly as the other players floundered with bouts of inconsistency. Winning this tournament was vindication from the criticism he has received… some of it even vile. The issue featured a very interesting assessment on each player in the Candidates along with some of the key games. One thing that can be learned about predictions is that they can easily serve as motivation. 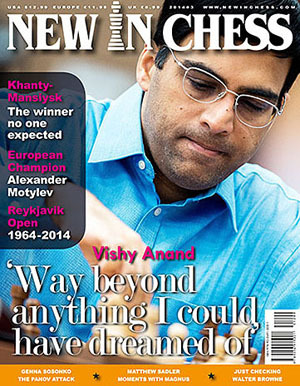 Anand played without added pressure of others and perhaps he was able to swoop under the radar. Will we see an Ali-esque performance in November? Stay tuned. There were interesting articles about unheralded by strong players such as Alexander Motylev (European Championship), Li Chao (Reykjavik Open) and a very interesting letter written by a KGB boss on Paul Keres. Must read. Matthew Sadler reviewed a number of books on Carlsen including one by his manager, Simen Agdestein. There is also an interesting article by GM Hans Ree about irregular openings. This includes Hungary’s Gabor Kadas 1.h4!? In the days of computers, everyone is looking for ways to neutralize the exhausted opening analysis. The modern-day aficionado could be another Hungarian, Richard Rapport with his 1.c4 c5 2.Nc3 g6 3.g4. There is a nice picture with Michael Basman who coined several irregular openings with his names such as Basman’s Defense (1.e4 g5?!? or 1.Nf3 h6?!?). In addition to Rapport, Alexander Morozevich is another active GM known for daring opening play. Finally, there is an interview with the legendary American Grandmaster, Walter Browne. The ‘Just Checking’ feature is probably one of the most interesting in a long time. The six-time U.S. Champion has certainly aged (pictured in the Reykjavik Open article). However, his exciting style and manic time pressure skirmishes are legendary. 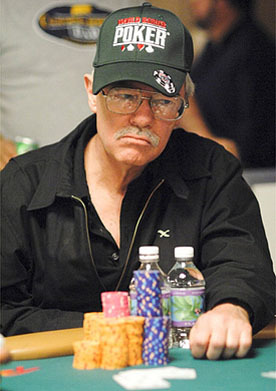 The Australian-born Browne is now a professional poker player and also a stock trader, but decided to return for the 50th anniversary of the event. There were three annotated games of his including a 1978 game with Lev Polugaevsky. Browne scored a respectable 7/10 in this year’s edition.